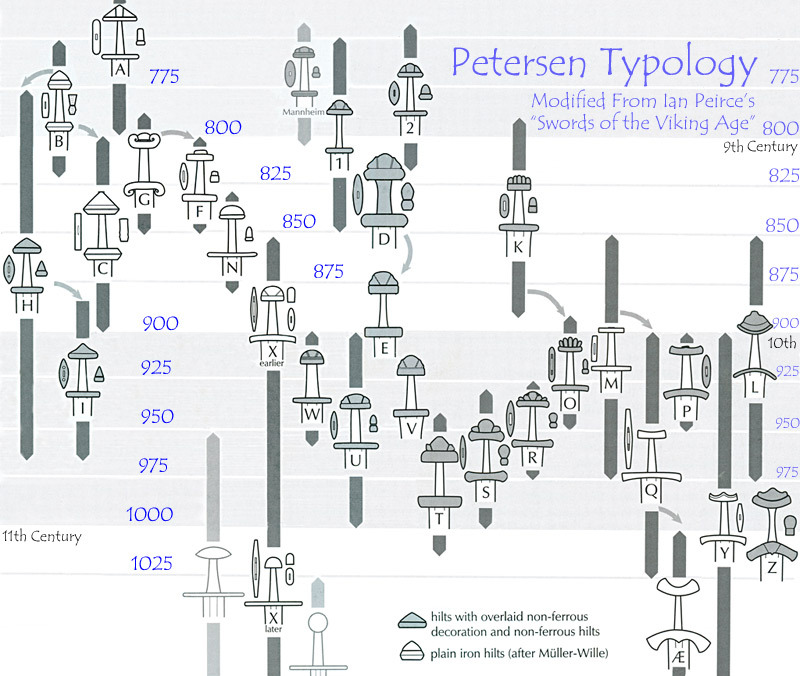 Over the last few years I have collected (and produced) charts related to sword typologies. This thread is started to provide access to some of these charts and to provide a place to include other helpful charts related to classification schemes of Viking Age finds. Petersen's Typology modified Chart in Ian Peirce's "Swords of the Viking Age"
Geibig's Blade Classification modified from "Entwicklung des Schwertes im Mittelalter" (The Development of the Sword in the Middle Ages). ...A few months ago I had a chance to work through Geibig's Monograph on Sword Typology: "Entwicklung des Schwertes im Mittelalter" (The Development of the Sword in the Middle Ages). It is a very important work... compiling much that has been learned about Viking Age Swords over the last century. "The Sword Typology of Alfred Geibig"
It seems that Geibig is most noted for the classification of blade forms. And this was the most original part of his monograph. However his work contains a tremendous amount of information on hilt types distinguished as combinations of pommels and guards. His illustrations give views of these forms from the top and sides as well as frontal views. This allows us to get a better idea of what the types look like in three dimensions. I have taken these charts and restructured them. 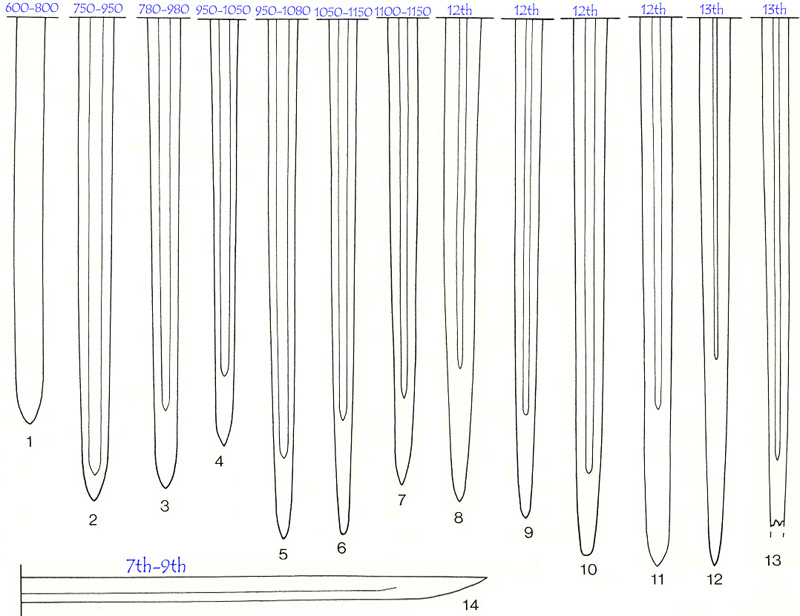 I put examples of the blade typology at the top of the chart and below this the Chronology of Geibig's combinations and their relation to Petersen's Typology. In the large field below this are the type combinations that Geibig has defined. In the progression from one combination to the next you can see the blade types that were used during the type these combinations were popular in the upper register outlined in red. I have downloaded each type combination in Geibig's sequence. The desire of this project is to try and create a video effect as each type moves along the timeline from left to right. To best see this you should download the images into a folder and arrange by Name (under view in windows). Then do a slideshow in rapid sequence. This should show how the Viking Age sword changed from the 8th to the 13th century. Very good work! I may have to get the ones in the original post enlarged and printed some time. I would like to motion that this gets put into the "features" section. Nice work Kirk - I missed this in 2008. Here's another chance for people to have a look. though that first chart doesnt seem to mention the tea cosy pommel.. Many thanks, Kirk for sharing this.